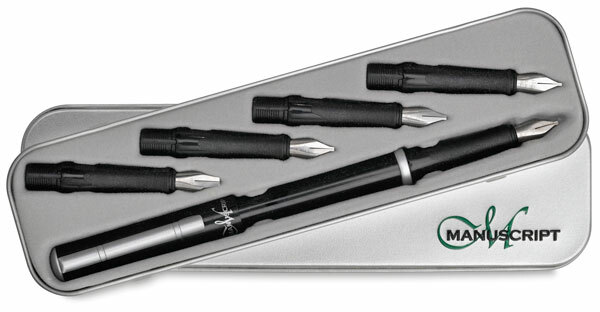 Beginning artists as well as experienced calligraphers can enjoy using these sets of precision-cut, interchangeable nib pens. 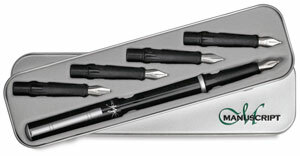 Both sets include a variety of nibs, ink cartridges, and a converter for use with bottled ink. 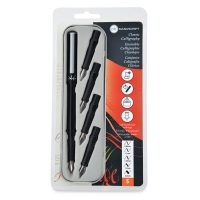 This set contains five interchangeable, precision-cut nibs, ink cartridges, a converter for use with bottled ink, and an instruction leaflet. ® Manuscript is a registered trademark.